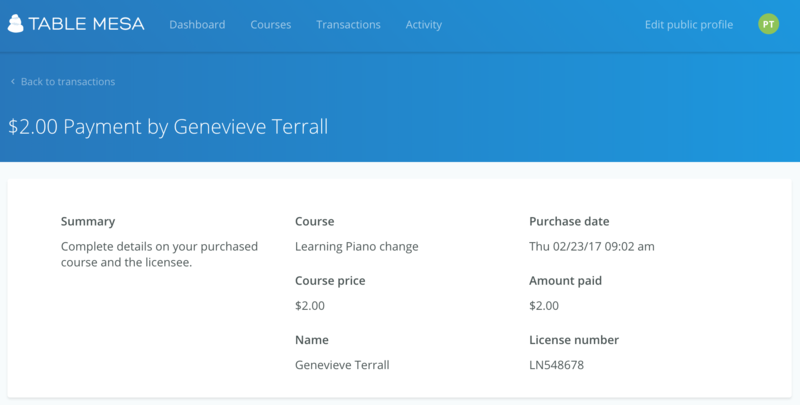 How can I access the data collected about licensees that take my courses? Use the metrics and data from your students to the fullest! To access information about your students, all you have to do is sign into your account and click on "Transactions" at the top of your profile page. If you scroll down, you will see a roster of those who have taken courses with you, and some data related to their specific actions. To view a specific user, click the 'Details' button on the right side of the table. That will pull up a more detailed list of information on the users purchase data. You can also download all of your student data as an excel file, to keep for your own records. Click the 3 dot menu on your 'Transactions' menu and you can download a CSV file of this information.